November is Diabetes Awareness Month! Help us spread the word about diabetes. More than 94 million Americans suffer from the epidemic known as Diabetes. November serves as Diabetes Awareness Month, and our Wellness Health Coach Program here at Wellworks For You can provide you with useful information from the American Diabetes Association. The American Diabetes Association, along with your wellness health coach at Wellworks For You, wants you to recognize the ways that diabetes sneaks into your life. Just because you were born diabetes-free doesn’t mean that you can’t get it later in life. There are a lot of factors that contribute to developing diabetes. Let’s take a look at the different types of diabetes. Gestational Diabetes This form of diabetes can be developed during pregnancy. Usually women begin to develop this around the 24th week, even with no previous history of diabetes. The doctor will perform a blood test to discover blood glucose (blood sugar) levels. This is important to make sure that both the mother and baby remain healthy during pregnancy. Type 1 Diabetes Typically found in children, type 1 diabetes is only found in 5% of the diabetes population. With type 1, the body does not produce insulin. This is typically treated with insulin therapy, but needs to be maintained for the rest of one’s life. Type 2 Diabetes This has become the epidemic of America. Type 2 is a form where your body does not use insulin properly. This is also known as insulin resistance. It begins with your pancreas creating too much insulin to make up for the past deficiency, and then over time your pancreas can’t keep up to keep your glucose levels normal. This can be treated with lifestyle changes and medication. Exercise is a key factor in lowering your blood glucose level. It increases your insulin sensitivity and utilizes your muscles. When your muscles contract, this allows your cells to use up the glucose for energy whether insulin is available or not. Eating breaks down the glucose (sugar) and sends it straight into your bloodstream. Your pancreas then creates insulin to move the glucose from your blood into cells to be used for energy. Avoid foods that are high in carbohydrates (a form of sugar). Also be sure not to miss any meals or snacks, as this increases your risk of not utilizing your insulin properly. Cholesterol and blood pressure work together to prevent diabetes and heart disease. So, be sure to take careful care of both. Keeping a low cholesterol and healthy blood pressure is important. Be sure that you’re eating right and exercising regularly. Also, stay in touch with your doctor, especially if your family has a history of high cholesterol or abnormal blood pressure. 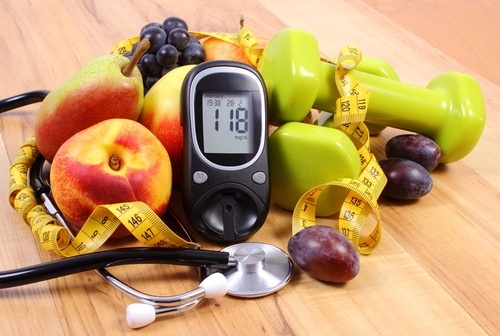 What are the ways you’ve kept diabetes at bay? We would love to hear about your favorite techniques, exercises and recipes. Please let us know your thoughts in the comments section, and if you have any questions please reach out to us on our contact page. If you’re in need of support for diabetes prevention, discover our wellness health coach program, and find out how we can better improve your work life and personal life with a healthy lifestyle that will last. You can check out our health and wellness coaching programs here, or give us a call at 800-425-4657.